Imperial Palace of the Chinese emperors during two dynasties, the forbidden city, as it is called nowadays in the West, is 600 years old but we arrived without much modifications. It is a fantastic testimony of the dynastic life that he gives us. The decorations are of great beauty and deserve attention because in addition to a simple decorative role they take on a symbolic role of importance. 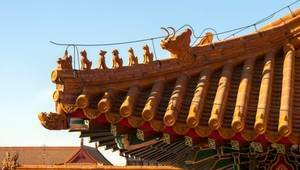 Perhaps the most important symbolic element of the Forbidden City, its layout is a model for those who lean towards it. 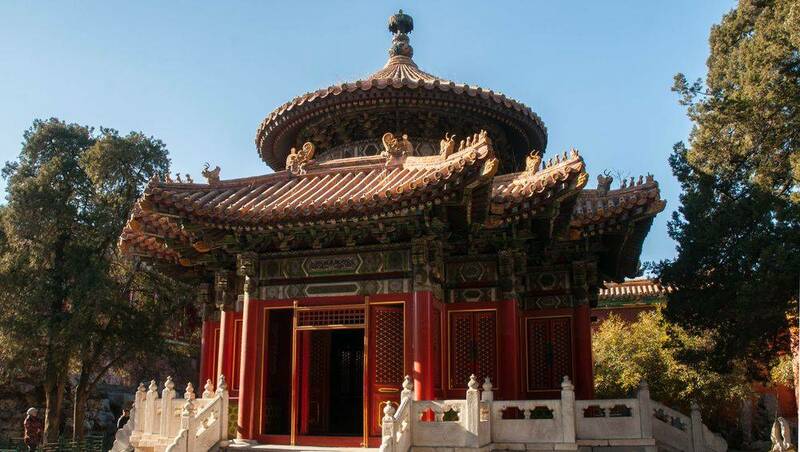 The palace is in the center of the city of Beijing, inscribed in a rectangle whose center is the palace of supreme harmony, the place where the power of the Chinese Empire is exercised. Cut in two by a line of symmetry, the entire forbidden city is dedicated to mathematical logic. The pavilions are built following the most perfect geometric rules possible, by even number most often. The inner courtyard - outer courtyard is also perfectly symmetrical, as is the river with golden waters whose waters enter and exit through two doors on either side of the side walls. The palace does not accept any curve, everything is drawn in a rectilinear way, putting forward the order, the regularity, qualities that should have been those of the Emperor. More pragmatically, we find that the emperor, who is associated with the God of Heaven, resides in the palace of celestial purity. His wife, associated with the Earth, was at the palace of earthly tranquility. In the inner courtyard, the side doors are dedicated to the Moon and the Sun, so that we find in this arrangement the four elements of the Universe, according to Chinese cosmology. This provision favored the stability of power, no element being missing. It is above all the geometry of the whole city that is the symbol of Chinese power, but it is not the only one. All the pavilions have decorations with high symbolic contents. Let's not start the roof. The design of the roofs is interesting. There are 10 kinds of different roofs in the palace, which are characterized by the presence or absence of a projection, its pyramidal or trapezoidal shape, the presence of a pinion, etc. Little by little the characteristics of the roofs will become very symbolic, relegating the fact that, first and foremost, they are intended for protection. The highest level of roofing is reached by the Pavilion of Supreme Harmony. It has ten mythical animals at each of its angles, which shows the superiority of those who are sheltered beneath. These mythical animals are characteristic of Chinese architecture Among them are a phoenix, a lion, a celestial horse and a sea horse, Suanni the dragon-lion, the dragon-kiss, Yayu the dragon-fish, Douniu the bull and Xingshi, the monkey. The dragon-kiss is supposed to be one of the nine sons of the dragon, he has the ability to control the fire. The phoenix brings happiness and luck to the building on which it is located; the lion indicates the power of the owner; horses show their ability to reach the sky and the sea; Suanni, also one of the dragon sons, is the king of the animal kingdom; Yayu, the dragon-fish, is able to collect clouds and put out the fire; Haetae, a unicorn, is synonymous with justice and right; Douniu, the fighting dragon, fights for peace; and Xingshi, the monkey, is an animal intended to prevent the destruction of the building by lightning. In practice these animals are heavy architectural elements which favor the maintenance in place of the roof, it is the initial role of these representations, but they quickly had a symbolic role, as we have just seen. The number of animals is an indicator of the power of the one living below, the higher the number, the more powerful it is. It is thus the pavilion of the supreme harmony which has the record, followed by the hall of the supreme harmony, then of the hall of the harmony of the medium and finally the pavilion of the Preserved Harmony. The terraces of the Forbidden City serve as support for the floor of each pavilion. Here again each terrace is perfectly hierarchical. First their heights are one of the characteristics of the power of the person living in the pavilion, as is the case for roofs. The highest terrace is of course that of the pavilion of supreme harmony, it is 8m high. The terraces of the pavilions of the outer court are built larger than the others. They have 3 levels. Other pavilions have their own particular terraces, depending on their status. Colors are also very important in the symbolic system of Chinese emperors. The two most important colors are yellow and red. Yellow is the imperial color, the emperors' clothes were mostly yellow. In Chinese culture yellow is associated with respect. This color is found mainly on the roofs of the pavilions, the tiles are almost always yellow, glazed. But there is an exception since the roofs of the children's pavilions are green. When red, it is actually purple. Purple, according to the Chinese symbolism, is the color of the polar star, the only star that seems to never move because it is in the axis of the Earth, and therefore in the center of everything. Perfect symmetry could not ignore the polar star, so it was purple that we dressed the forbidden city. Moreover this color also represents the hope of the stability of the emperors, in ancient Chinese symbolism. While walking in the forbidden city one often falls on statues of marble or bronze, to see painted or ceramic decorations. Most of the time they have a very specific meaning. For example, in front of the palace's main pavilion, the famous Palace of Supreme Harmony, there is a sundial and a grain measure. These are symbols of imperial justice, quite simply. Otherwise, each animal has a role in the Chinese imagination. These are two opposing concepts in the Chinese imagination. Yin is associated with femininity, it symbolizes the Empress and is characterized by even numbers. Yang is associated with the emperor, it is characterized by odd numbers. When it came to deciding the number of pavilions for example, this principle was applied, as in everything here. But that's not all: According to the Chinese, the universe consists of 5 elements: Water (associated with the empress and the northern pavilion), fire (associated with the emperor, it is more about the southern pavilion), the wood (associated with the culture, the pavilions are rather in the East), the metal (associated with the military arts these are the western rooms), and finally the earth, which is present everywhere at once. This distinction by element of the universe has been perfectly reproduced in the forbidden city thanks to the layout of the pavilions. 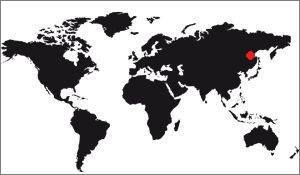 According to Chinese civilization the number 10,000 is a limit of what is countable, at least symbolically. Beyond, they considered that they were in the uncountable, and thereby becomes a deified number. 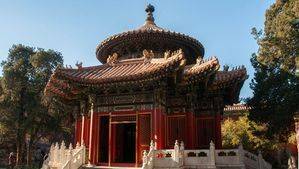 According to ancient texts the forbidden city would contain 9999 pieces, not to reach the fateful limit making the palace at the same level as the habitat of the Gods. 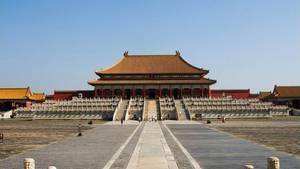 Any study done, the forbidden city has approximately 8500 rooms, so the legend is false. Another principle is often respected, even if it is more questionable: It is that of the number 9. It is found in many places, such as the number of animals visible on a roof, or the number of nails on the doors.